Introducing Allkauren koi, a ridiculously looking flying reptile with a very cool name. The fossilized remains of this newly discovered pterosaur were discovered in the Patagonia region of South America, and it’s shedding light on the origin and evolution of these ancient creatures. 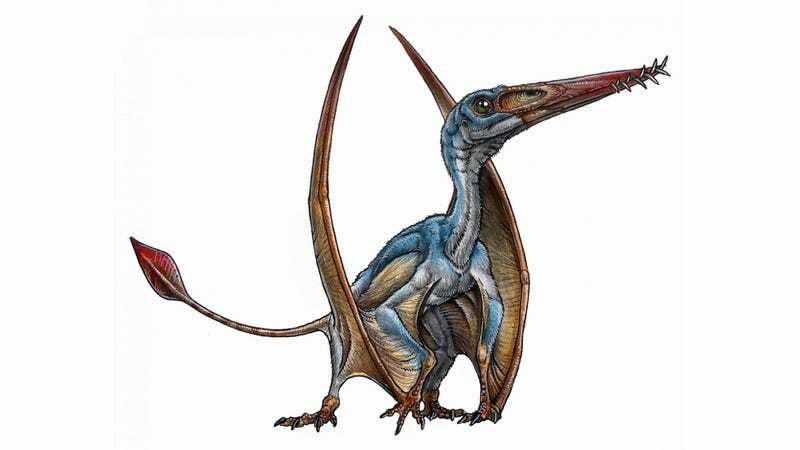 In a new study published in PeerJ, a team of international researchers led by Oliver Rauhut from the Paleontological and Geological Museum in Munich, Germany, describe the new species of pterosaur, which roamed the skies during the Early Jurassic some 190 million years ago. Pterosaurs are an extinct group of flying reptiles that were extremely well adapted to flight, featuring super lightweight bones and an elongated “finger” that supported a bat-like wing membrane. Very little is known about these ancient creatures owing to the poor fossil record. Translated from the native Tehuelche, Allkauren means “ancient brain,” while koi is the lake found near the fossil site. The extinct reptile was given this peculiar moniker on account of its exquisitely preserved and uncrushed braincase. Using computed tomography, the researchers were able to peer inside the pterosaur’s braincase in three dimensions, observing the interior of the skull and inner ear. Prior to this discovery, researchers had only a few three dimensional, preserved remains, so little was known about how pterosaurs evolved from more primitive reptiles. Allkauren koi’s highly developed features show the significant degree to which these animals had become specialized by this stage in the Jurassic. This study paints a clearer picture of pterosaur evolution, showing how they emerged from the more primitive “rhamphorhynchoids,” an early species of pterosaur with a markedly different head posture and neuroanatomy. At the same time, Allkauren koi wasn’t as “advanced” as its descendants. Analysis of its braincase and inner ear shows that it existed in an kind of intermediate state during the pterosaurs era, and that it was still adapting to the air.